Sardinia in 5 Senses: Download your e-book for free! Which is the best travel philosophy to discover Sardinia? According to our personal experience, the “5 Senses” are the infallible guide to visit the Island. This philosophical approach has a strong personal component and gives you the chance to get in touch with the real soul of the Island. 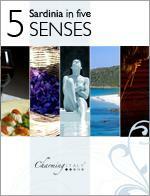 The first issue of the 5 Senses Collection is a practical and easy-to-share e-book. It presents Sardinia through your sight, touch, hearing, smell and taste. Your E-book “Sardinia in 5 Senses” is available for free.